Find gift wrap, gift bags, gift tags, ribbons and everything you need to keep it all organized, right here at The Container Store. We regularly collaborate with designers to bring you the most festive, luxurious wrapping paper, holiday gift wrap, colorful gift totes, sturdy but pretty gift boxes and food packaging so you can create an impressive gift presentation. You'll even find ideas for party decorations and party favors for all your celebrations. 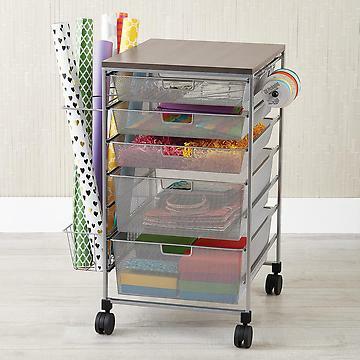 When the special occasion is over, we have wrapping paper storage, gift wrap carts and gift wrap organizers that sort paper rolls, tissue paper and accessories, then slide easily into a closet or under the bed. Designed especially for organizing oversized rolls of gift wrap, our tall Vertical Wrap Box holds up to 20 rolls of 40" paper. Its durable construction snaps shut to protect contents and keep wrapping paper dust-free. Slim dimensions make it an easy fit in a closet or craft room. After selecting one of our sensational gift wraps, you'll need the perfect Gift Box . Then complete your gift presentation in impressive style with Ribbons & Bows . If you're in a hurry, our Gift Totes & Bags ensure your gifts look fabulous in record time.